After working for mainstream, organized religion for a few years, I found myself called to leave! I became a high school math teacher and founded Religion-Outside-The-Box – which empowers adults to find and be with the God of their understanding. ROTB seeks to feed the spiritually hungry, much like doctors-without-borders – wherever help is needed. 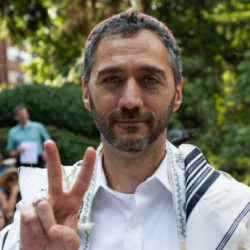 My initial question to you will be, “What is it that you feel you need to do so that you will feel authentic telling people you are Jewish?” From that start, we figure out options. Just as no two people are alike, neither is your path and that of anyone else. I look forward to seeing how I can help.